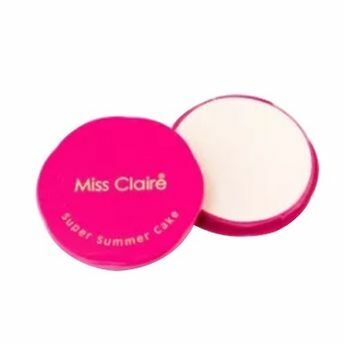 Miss Claire Cosmetic Super Summer Cake is a unique makeup product with a combination of a powder, foundation and moisturizer, all 3 in 1. The unique formula helps cover skin blemishes and freckles and gives you a natural picture look. It does not darken or discolor your skin and stays on all day despite hours in the sun and humidity. The product comes in a wide variety of shades to match every skin tone and color. Additional Information: Presenting an entire colorful range of face, lips and eye cosmetics that enhance your beauty and amplify your daily makeup looks. Loved by Makeup fans across India, Miss Claire Cosmetics are of premier quality, trendy, affordable and are formulated using the finest ingredients that care for your skin. These are manufactured in accordance with European Standards. Choose from a huge range of Miss Claire makeup and beauty products right from Lipstick, Bronzers, Highlighters, Foundation, Eyeliners to concealers all available in highly pigmented formula and textures. Miss Claire makeup products are affordably priced, are long lasting and suit all skin tones and skin types. Explore the entire range of Foundation available on Nykaa. Shop more Miss Claire products here.You can browse through the complete world of Miss Claire Foundation .Alternatively, you can also find many more products from the Miss Claire Super Summer Cake range.